Just like starting your first job, getting married or having kids, retirement will change your life. Some changes are small, like sleeping in or shopping during regular business hours. Others, however, are significant and worth examining ahead of time… like how much you’ll be spending in retirement each month or each year. 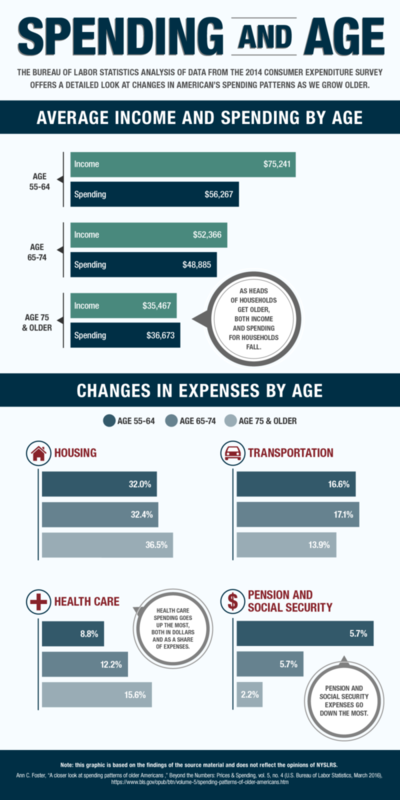 While data supporting EBRI’s study is helpful, it turns out that the highlight of the Consumer Expenditure Survey results is a detailed look at how the things we spend our money on change as we grow older. As interesting as that is, it’s just a general look at how older Americans are managing their money. What really matters is: How will you spend your money once you retire? Like a fiduciary choir, financial advisors all sing the same refrain: Start young; save and invest regularly to meet your financial goals. If you do, the switch from saving to spending in retirement can be easy. But, in order to make that transition, you need a budget. The first step toward a post-retirement budget is a review of what you spend now. For a few months, track how you spend your money. Don’t forget to include periodic costs, like car insurance payments or property taxes. 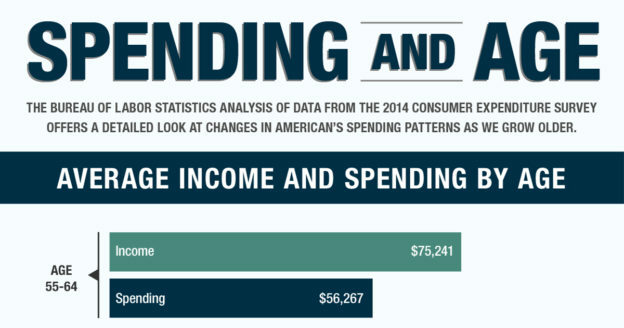 By looking at your current spending patterns, you can get an idea of how you’ll spend money come retirement. Then, consider your current monthly income, and estimate your post-retirement income. If your post-retirement income is less than your current income, you might want to plan to adjust your expenses or even consider changing your retirement date. 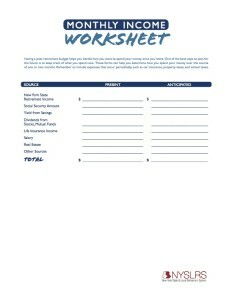 We have monthly expense and income worksheets to help with this exercise. You can print them out and start planning ahead for post-retirement spending. For those of you who carry smart phones, Forbes put together a list of popular apps for tracking your daily spending. All of them are free, though some do sell extra features. Many of them can automatically pull in information from your bank and credit card accounts, but if you’d rather avoid that exposure or if you use cash regularly, you may prefer an app that lets users enter transactions manually. Content last revised August 29, 2018. This entry was posted in General News, Members and tagged benefits, budget, ERS, monthly expenses, monthly expenses worksheet, monthly income, New York State & Local Retirement System, NYSLRS, NYSLRS Retirees, personal savings, Personal Savings Plan, PFRS, post-retirement budget, Preparing to Retire, retirement, retirement planning, retirement security, spending, spending in retirement on August 29, 2018 by NYSLRS. The 178th Great New York State Fair opens next week and NYSLRS will be there. The 13-day celebration of everything New York runs through Monday, September 3 (Labor Day). Our information representatives will be at the fairgrounds, as they have been for more than 20 years, to help members and retirees with their retirement planning and benefit questions. In the past, many NYSLRS members have stopped by the booth to get a benefit projection. You’ll also be also be able to pick up retirement plan brochures and forms or have a consultation with one of our information representatives. The NYSLRS booth will be in the Center of Progress Building, building 6 on the State Fair map, near the Main Gate. Once inside, you can find us against the wall on the east side. OSC’s Office of Unclaimed Funds booth will be in the same building, just across from the NYSLRS booth. An unclaimed fund is lost or forgotten money, perhaps in old bank account or insurance policy that has been turned over to the State. See if any of that money might be yours. So far this year, State Comptroller Thomas P. DiNapoli and the Office of Unclaimed Funds has returned more than $284 million. 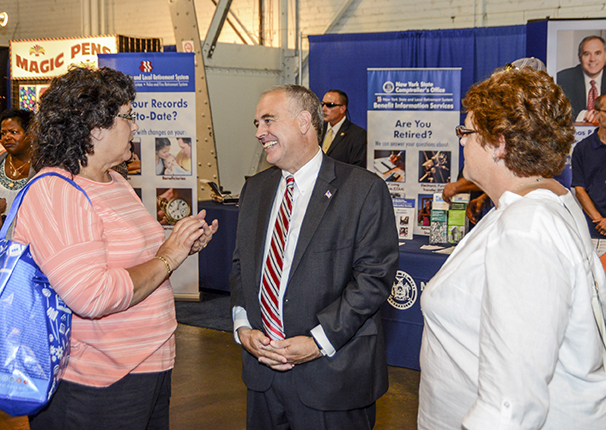 Comptroller Thomas P. DiNapoli greets a NYSLRS member at the Fair. The Retired Public Employees Association (RPEA) will also have a booth in the Center of Progress Building. 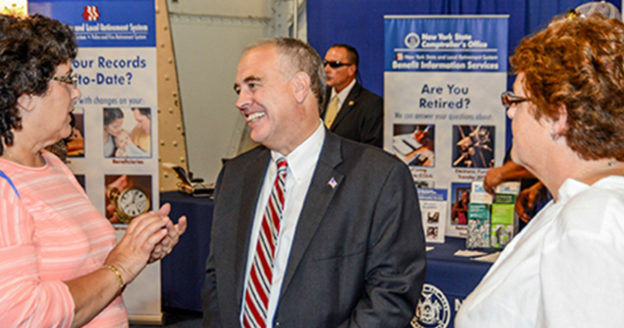 Comptroller DiNapoli Visits the Fair — He manages the $207.4 Billion State Pension Fund and is the administrator of NYSLRS. He’ll be stopping by NYSLRS’s booth during the day. Note: ID required for free admissions listed above. For details, check out the complete schedule of Special Fair Days. Content last revised August 22, 2018. This entry was posted in General News and tagged Comptroller Thomas P. DiNapoli, ERS, members, New Members, New York State & Local Retirement System, NYS Fair, NYSLRS, PFRS, Retirees, State Fair, The Great New York State Fair, Unclaimed Funds on August 22, 2018 by NYSLRS. 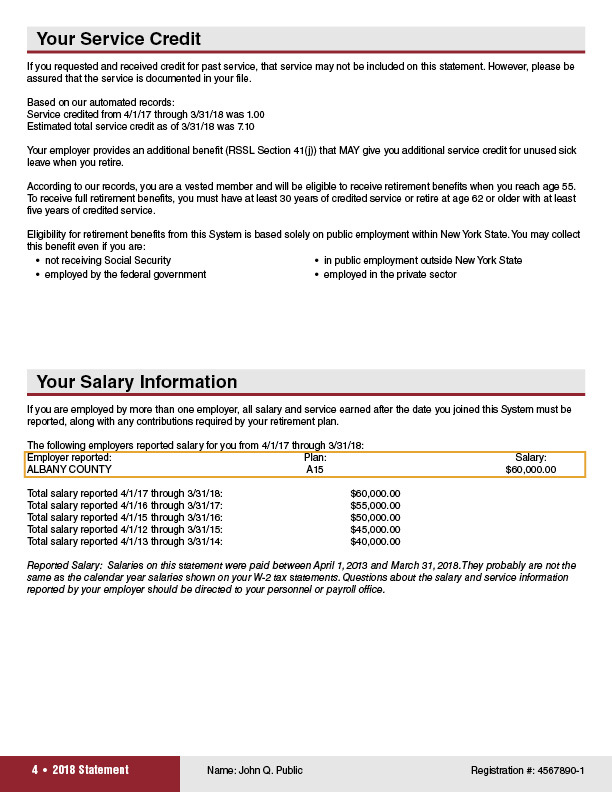 The formula used to calculate your NYSLRS pension varies by tier and plan, but your credited service and final average salary (FAS) are the main factors. You earn service credit for paid service with participating employers, and you also may claim it for some previous public service. Your FAS is the average wage you earned during the time period when your earnings were highest (36 consecutive months for Tier 5 and 60 consecutive months for Tier 6). Your FAS can include overtime pay that you earned during that period. However, for Tier 5 and 6 members, there are limits to how much overtime can be used to calculate your pension. While you can earn overtime beyond the limit, anything over it will not count toward your FAS or your retirement benefit. Members and employers aren’t required to make contributions on overtime pay that is above the limit, and your employer shouldn’t report it to us. The overtime limit for Tier 5 Employees’ Retirement System (ERS) members increases each calendar year by 3 percent. This year, the limit for Tier 5 ERS members is $19,001.55. For 2019, it will be $19,571.60. 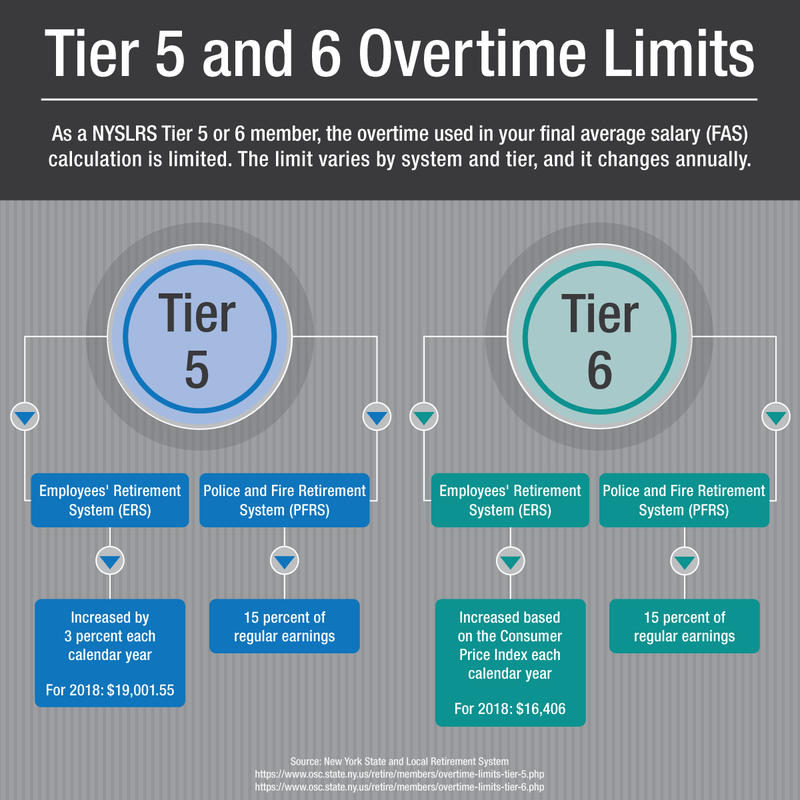 For Tier 5 Police and Fire Retirement System (PFRS) members, the overtime limit is 15 percent of your regular earnings each calendar year. The overtime limit for Tier 6 ERS members increases each calendar year based on the annual increase of the Consumer Price Index (CPI). For 2018, the limit is $16,406. For Tier 6 PFRS members, the overtime limit is 15 percent of your regular earnings each calendar year. Find more information about the overtime limit, FAS and retirement calculations in your retirement plan booklet, available on our Publications page. 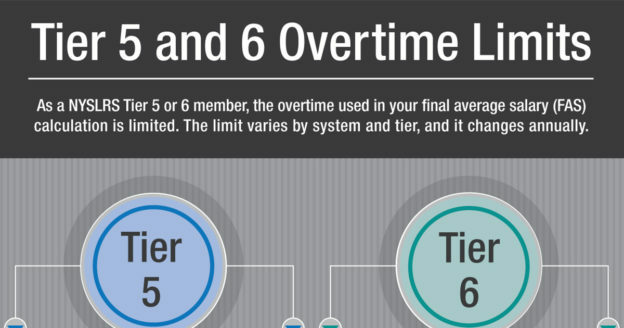 Find more information on our overtime limits pages for Tier 5 and Tier 6. And, find your retirement plan booklet on our Publications page for details about overtime, FAS and retirement calculations. Content last revised September 12, 2018. This entry was posted in General News, Members and tagged ERS, FAS, FAS limits, Final average salary, members, New York State & Local Retirement System, NYSLRS, Overtime, overtime limits, pension, PFRS, police and fire retirement system, retirement, Service credit, Tier 5, Tier 6 on August 15, 2018 by NYSLRS. Information is the key to being fully prepared for your retirement years. The single most important thing you can do to achieve this goal is to know what NYSLRS retirement plan you’re in. Once you know that, the next thing you must do is understand the benefits your plan provides. Your retirement plan booklet covers things like how long you’ll need to work in order to receive a pension, how your pension amount is determined, and what kind of death and disability benefits may be available to you. You can find a copy of your plan booklet on our Publications page. But here’s the challenge: NYSLRS manages 335 retirement plan combinations, which are described in 51 plan booklets. How do you figure out which is yours? The information below should help. To get started, you need to answer two questions. The Employees’ Retirement System (ERS), which is for public employees in non-teaching positions. It also includes some law enforcement personnel, such as correction officers, sheriffs and sheriffs’ deputies. Question Two: Which tier are you in? 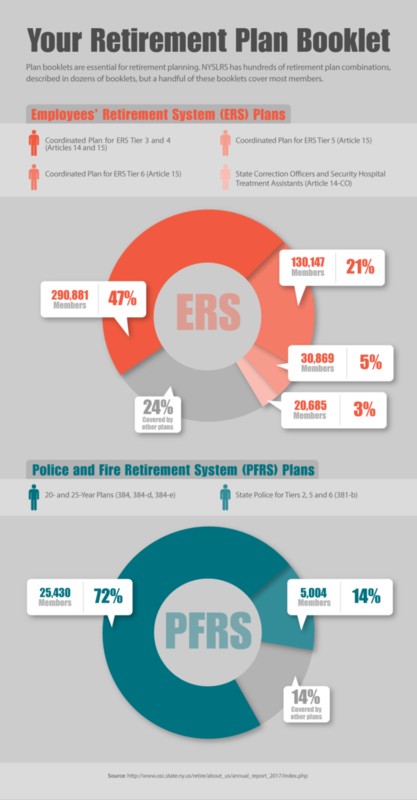 There are six tiers in ERS and five tiers in PFRS. Your tier, based on when you joined NYSLRS, determines such things as when you become eligible for benefits and how much you contribute. You can find your Tier on page 2 of your Member Annual Statement (MAS) or you can check the NYSLRS website. For many members, knowing your retirement system and tier are enough. But for other members, especially those in law enforcement, it may help to have your retirement plan number as well. The plan number indicates the section of Retirement and Social Security Law the plan is based on. For example, Plan A15 indicates that you are covered by Article 15. You can find your plan number on page 4 of your MAS, in the Salary Information section. Roughly three-quarters of all ERS members are covered by Article 15; they just need to know their tier to find the correct booklet. If you are still unsure which retirement plan booklet covers your benefits, you can send us an email using our secure contact form , or you can ask your employer. It cannot be stated enough how important it is to read your plan publication to learn all you can about your benefits. It is the key to solid retirement planning. Remember, no one has a more vested stake in your retirement than you do. Content last revised August 8, 2018. This entry was posted in General News, Members and tagged benefits, ERS, Information is the Key, know your benefits, members, New York State & Local Retirement System, NYSLRS, PFRS, Plan booklet, retirement plan, Retirement plan booklet, retirement planning, tier on August 8, 2018 by NYSLRS. 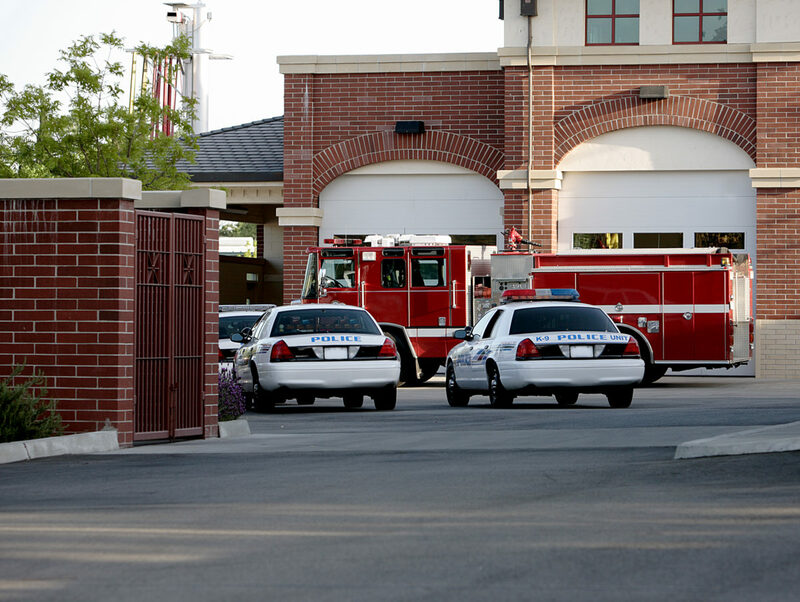 The New York State and Local Police and Fire Retirement System (PFRS) provides service and disability retirement benefits, as well as death benefits to more than 35,000 police officers and firefighters. Most PFRS members are covered by a plan that allows for retirement after 20 or 25 years, regardless of age, without penalty. As a member, you earn credit toward that requirement through paid public employment with participating employers. However, not all public service counts toward your 20 or 25 years. What Credit Counts Towards Retirement? The public service that can be used toward your 20 or 25 years is determined by the specific retirement plan under which you’re covered. Check your retirement plan booklet for details. There are booklets for state police , forest rangers , regional state park police , state university police , EnCon police and members covered under Sections 384, 384-d and 384-e of Retirement and Social Security Law (RSSL). More plan booklets are available on our Publications page. In the military, as specified by law. In the 384-e retirement plan, civilian service, as well as service as a sheriff, corrections officer or volunteer firefighter, is not creditable. If you have worked for multiple New York State public employers and are unsure if all of your service is creditable towards your 20 or 25 year plan, contact us before transferring membership or purchasing service credit . Please note: the public service that can be used toward your 20 or 25 years is determined by legislation and differs among plans offered to PFRS members. You should also be sure to request an estimate from us well before your planned date of retirement if there is any question about your creditable service. PFRS members should request an estimate from us as early as 18 months before you plan to retire. It’s the best way to make sure you have all the credit you’re entitled to. Simply fill out and return a Request for Estimate (RS6030) form. Content last revised August 1, 2018. This entry was posted in General News, Members and tagged benefits, Creditable Service, estimate, New York State & Local Retirement System, PFRS, Police and Fire, Preparing to Retire, purchasing credit, purchasing service credit, request an estimate, retirement, Service credit, transferring membership on August 1, 2018 by NYSLRS.